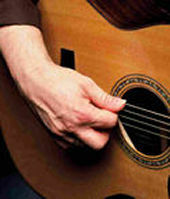 Inventive solo arrangements for acoustic guitar and voice. A CD dedicated to my mother, Jeff Buckley, and a few friends. Click THIS LINK to see a VIDEO of me performing ALL of Bohemian Rhapsody LIVE! Written by Leonard Cohen, published by Sony/ATV Songs, LLC (BMI). Intro arranged by Jeff Buckley. Total playing time: 39:03 All songs used by permission. All rights reserved. All songs were recorded live in my bedroom/office, with three microphones running simultaneously: Two Rode NT-2s (acoustic guitar) and a Shure KSM-32 (vocals). The vocal mic was run through an HHb Radius 40 Tube Voice Processor (mic pre), while the guitar mics went to a Presonus BlueTube (stereo mic pre). Everything was recorded in 24-bit, direct to hard disk (Beige G3 MiniTower, using MOTUs 1224 w/AudioDesk software). A Larrivée CS-09, strung with John Pearse strings, was used throughout (except for track #7, played on a Martin 0001R Auditorium Series). Prior to August 1998, when I first heard the eclectic vocal/guitar stylings of Jeff Buckley, I was the last guy who ever messed with playing other peoples songs. Sure, I played some coverseither for cover band gigs, solo performances at weddings, etc.but I never took it as a serious artistic pursuit. Basically, hearing cover songs (on radio or record) usually hit me like the artist thought, Hey! Lets record a song someone else wrote, thats already great to begin with, but lets do it with [insert modern production approach here] to update it so we can cash in! It really bugged me when I heard cover songs that were essentially rehashes of the original. What you hear on this recording is 10 songs I recorded at the tail end of this period, all of which were written by artists who thrived in the 1960s and 1970s. At the very least, I hope people dig the somewhat adventurous approach I took in arranging these tunes! I certainly had fun assembling them. Thanks for listening! Piano and ensemble figures arranged for acoustic guitar and voice. Transposed down one whole step from Bb to Ab. (I learned this song first in Bb, playing in standard tuning with a capo at the 1st fret, but play it here on a capo-less guitar tuned down 1/2 step, FYI.) In listening to this, it probably wont take you long to conclude that this was fun as hell! The opera part pretty much says it all. Id never heard one person try to pull off this famed Galileo section. Most of my aforementioned friends eyes were watering (from laughter) after hearing this! Features lots of vocal improvisation. Piano and ensemble figures arranged for acoustic guitar and voice. Played in the original key of... E? A? F#m? Bm? Whatever key(s) it is, I like it :) One of several Pet Sounds-era songs I learned in 1999-2000. Played in the original key of D major, at a slower tempo, and with a swing feel. Performed 99% pickstyle, as opposed to w/fingers. Features an intro arranged by Jeff Buckley. Transposed down one whole step from C to Bb (with a capo at the 3rd fret). This is a tribute to Jeff Buckley, who I feel is one of the greatest male vocalistsand self accompanistsof all time. Nevertheless, I tried to not rip him off! (Who could?) Includes a unique guitar solo/interlude and a totally improvised ending. Actually, I didnt even know how I was going to end it, because, for whatever reason, Id never played the song all the way to the end before recording it. Piano arranged for strummed acoustic guitar (tuned down 1/2 step). I used mostly homemade, open-string chord voicings, throughout. Played in original key of Eb. For what its worth, its impossible for me to listen to the original version of this song and not think of my personal mentors whom are no longer on this planet, namely EC Duke Miller, Paul LaRose, and my dynamite dad, Doug Turner. I kept the ol emotions in check though, and didnt lose it in the 3rd verse , though my voice sorta cracks. Transposed down one half step from Ab to G (i.e., without Fogelbergs capoed 1st fret). This is really the only song I didnt mess with in some way. Transposed down a minor 3rd from E to Db (w/capo at 1st fret), played at a faster tempo than the original. I fabricated a pretty elaborate Travis Picking arrangement for this, replete with some fancy Carter strummingplaying country-style alternating bass notes with percussive strumsin the 3rd verse. 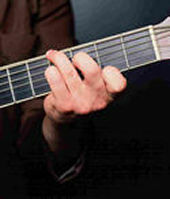 How many ways can I play a C7 chord? Listen to this track to find out :) FYI, the crashing sound at the end is my set of headphones hitting the floor! I originally intended to fade it out, but figured it punctuated this disc nicely, so I left it in. Ultra-Fi: Unique, deeply personal, extreme, and even bizarre expressions of audio reproduction.